I am not a professional copywriter by any means, but I do appreciate well-written content when I see it. Even as a reader it gives me quite a bit of satisfaction to read good copy, I can only imagine the gratification that the writer gets from a beautifully crafted message. As a marketer, I have always been told about the importance of copywriting and how even the smallest of details in a message can change people’s perceptions. Intellectually, I know how critical it is but I still get surprised when I come across research data that shows the result of minor copy tweaks in metrics such as sales revenue. Dr. Robert Cialdini is a Professor of Psychology at Arizona State University and the writer of New York Times Business Bestseller Influence: The Psychology of Persuasion. He has done extensive research in consumer psychology and behavioural analysis. In one of research studies, he examined the donation process of the American Cancer Society and how a minute change in copy resulted in drastically different outcomes. The researchers used two different phrases for door-to-door donation requests to see if the variation will make a difference the amount of donation received. Phrase 1: Would you be willing to help by giving a donation? Phrase 2: Would you be willing to help by giving a donation? Every penny will help. As you can see, we are looking at a very subtle difference between the two messages. The results, however, are not so subtle! People who were asked the second phrase were almost twice as likely to donate than people who were given phrase 1! 28% vs 50% to be exact. Just by reframing the concept of helping in a way that communicates the importance of even a penny, the message was able to make a connection with people who would otherwise think they would be expected to pay lots of money to actually contribute to the cause. And the interesting thing is amount of money they donated did not diminish. Knowing that “even a penny” helped still catalyzed them to give as much as respondents to the first phrase gave. As you may or may not know, Uber and Lyft are both transportation network companies that offer peer-to-peer ridesharing services to customers. They are extremely popular alternatives to traditional taxis, especially among millennials who like to do everything via apps. Although Vancouver prides itself as being the tech hub of Canada, we are deprived of great technologies like these, but I promise you they are real and they are actually incredibly useful. One of the things with both of these services is the surcharges that apply in busy times such as Friday after work. 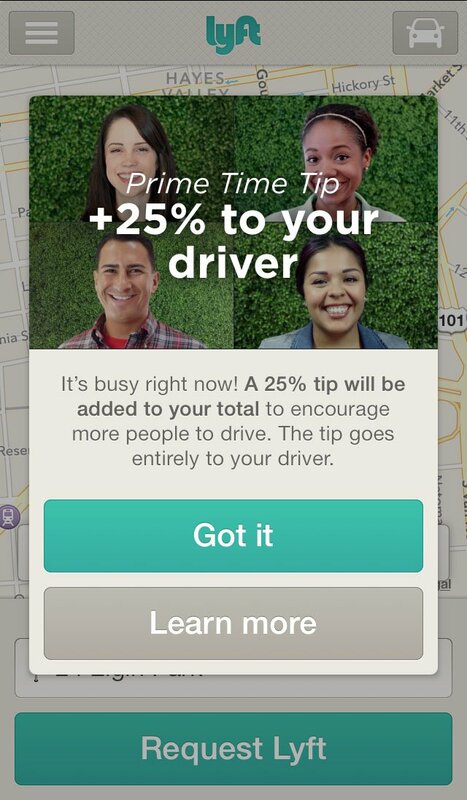 In high demand times like this, the riders are charged an additional fee that is applied towards a tip to the driver. Let’s be honest, nobody likes to pay extra so there is no sugarcoating it. There are, however, different ways to say it so that it generates different responses in the customer’s mind. How long would you be willing to walk to avoid paying a 25% premium? This is the question that one asks himself when using Lyft at prime time. 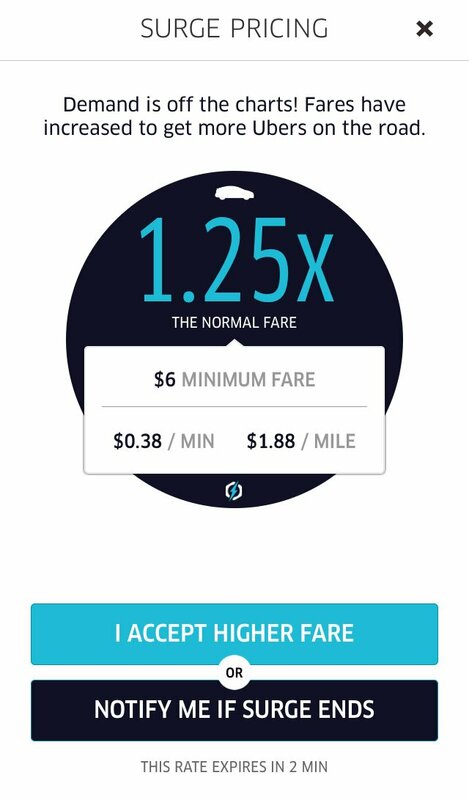 How long would you be willing to walk to avoid paying 1.25x the normal fee? This is the question that one asks himself when using Uber at prime time. Same fee, same essential message, different delivery. Close to 45% of participants surveyed said that they would walk 5 minutes to avoid the surcharge when it was presented in a percentage format. When it was presented in a numeric format (1.25x) 38% of participants said that they would walk 5 minutes to avoid the charge. The difference between 45% and 38% may not seem that critical at first sight but remember the scale at which these services are being used everyday all day. To put that in context, Uber has more than 10 million users just in the US. So the difference between a 45% acquisition rate and 38% acquisition rate adds up to 700,000 users. Based on an average transaction value of $20, that could be $14,000,000 in lost revenue. And all because of a tiny difference in presentation! I think the biggest question people have when looking at all these examples is “how do I know what is going to work and what is not?”. It’s a fair question because you don’t know what you don’t know… This is where techniques like A/B tasking come to the rescue. With today’s advanced marketing tools even small businesses with limited budgets are able experiment with testing different ideas in the market. If you can’t pay millions of dollars to market research firms, you can always conduct your own research out in the real world. The only caveat is that you need to be able to track all the data from your experiments. At least the data that is going to be meaningful to what you are trying to find out. If you launch an email newsletter campaign with a few different versions that feature a different subject line, messaging, imagery etc, you need to be able to track which ones are generating more lead and/or revenue for you. At the end of the day, the goal is to shift from shooting in the dark towards a more conscious and aimed marketing strategy that will work for you.